The premium variety of Mosaic Glass Flower Vase offered by us is specially manufactured from high-grade glass and aluminium, We are instrumental in manufacturing, exporting, and supplying of a quality range of Mosaic Glass Flower Vase. 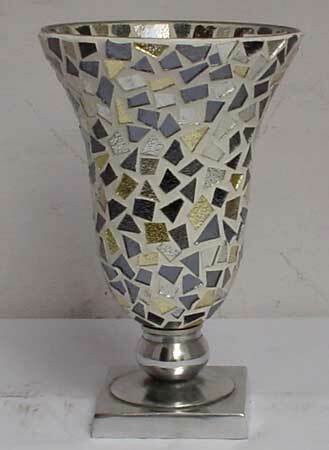 This beautifully crafted Mosaic glass Flower Vase is available with aluminium polished base. It is widely demanded by the clients for its superior quality and longer life. The clients can avail our designer array of Mosaic Glass Flower Vase at competitive prices.